302 pages | 9 B/W Illus. The joint challenges of population increase, food security and conservation of agrobiodiversity demand a rethink of plant breeding and agricultural research from a different perspective. While more food is undeniably needed, the key question is rather about how to produce it in a way that sustains biological diversity and mitigates climate change. This book shows how social sciences, and more especially law, can contribute towards reconfiguring current legal frameworks in order to achieving a better balance between the necessary requirements of agricultural innovation and the need for protection of agrobiodiversity. On the assumption that the concept of property can be rethought against the background of the 'right to include', so as to endow others with a common 'right to access' genetic resources, several international instruments and contractual arrangements drawn from the plant-breeding field (including the Convention on Biological Diversity, technology exchange clearing houses and open sources licenses) receive special consideration. In addition, the authors explore the tension between ownership and the free circulation and exchange of germplasm and issues such as genetic resources managed by local and indigenous communities, the ITPGRFA and participatory plant-breeding programmes. 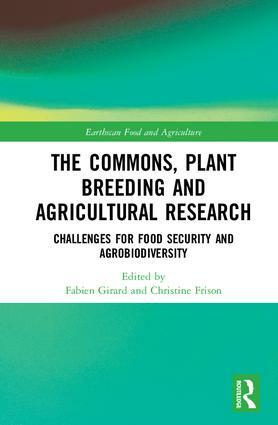 As a whole, the book demonstrates the relevance of the 'Commons' for plant breeding and agricultural innovation. 3. Patent & Benefit sharing. What can we learn from the Quassia amara lawsuit? What is the problem? Part IV: A New Vitality for the Bio-Commons? 14. Geographical Indications and the Commons: What Matters? 15. Bio-commons in an industrialized country: a viable option? Part V: Thinking Global: a Global Commons for the Seed? Fabien Girard is an Associate Professor in the Faculty of Law at Université Grenoble Alpes (UGA), France, and also an Associate Research Fellow, Maison Française d’Oxford (MFO), UK. Christine Frison is a Postdoctoral Research Fellow both at the Research Foundation – Flanders (FWO) with the Law Faculty of the University of Antwerp, Belgium, and at the Fund for Scientific Research (FNRS) with the Institute for Interdisciplinary Research in Legal Sciences (JUR-I) of the Catholic University of Louvain, Belgium. This series includes a wide range of inter-disciplinary approaches to food and agriculture, integrating perspectives from both social and natural sciences. It includes textbooks, research monographs and titles aimed at professionals, NGOs and policy-makers. Authors or editors of potential new titles should contact Hannah Ferguson, Editor (Hannah.Ferguson@tandf.co.uk).